And that time is always today." There are hundreds upon thousands of realms among us. Here are some that are owned by other fellow Anime lovers like me! Click on the realm that you wanna go to and you'll be automatically transported there. I'm trying to broaden the links here, therefore it you know of a Anime site or have one of your ownt hat you would like posted up here for others to see, please feel free to Send It to me. All I ask is that you send me the name of the site and the person who owns it and I'll be sure to post it up on the next update. 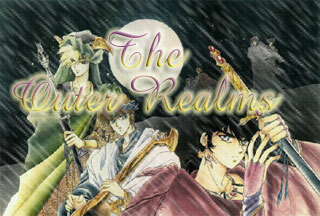 DEVON'S REALM--Owned by Devon Masterson! THE RONIN MANOR--Owned by Derrian Star! YORODEN SAMURAI TROOPERS TEMPLE--Owned by Theria! AMANDA SWIFTGOLD'S FANFICTION/RONIN WARRIORS--Owned by Swiftgold! THE RONIN WARRIORS' MAGMA LAIR--Owned by Magma Angel! YOAKE HALO'S FANFIC PALACE--Owned by Yoake Halo! KAYSHA HASHIBA'S RONIN WARRIORS' PAGE--Owned by Kaysha Hashiba! KAKKI'S RONIN WARRIOR'S PAGE--Owned by Kakki! THE RONIN DUNGEON COLLECTION--Owned by Jasson Knight!